Aerodynamics Conceptual & Preliminary Analysis and Design. Hanley Releases Stallion 3D, a 3-Dimensional Compressible Flow Solver with Automatic Cartesian Grid Generation and Built-in Post Processing. OCALA, Florida, June 16, 2009 - Hanley Innovations, a leader in the development of software for aerodynamics conceptual design and analysis, announced the availability of Stallion 3D, an all-in-one three-dimensional compressible flow analysis software package for Windows XP/Vista PCs. Stallion 3D: Flow past delta wing, AR=1, flow angle=35 degrees. 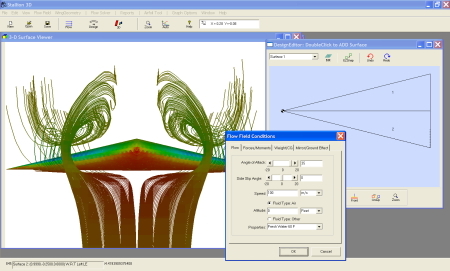 Stallion 3D allows users to enter single or multiple CAD drawings (saved in the .stl file format) into the program for a three dimensional computational fluid dynamics (CFD) analysis. In addition, components such as wings, cylindrical shapes and closed bodies can be added to the analysis using the built-in geometry engine. Users can position and rotate any of the components to match a desired test setup. The built-in pre-processor automatically detects the immersed boundaries and generates a Cartesian grid for the entire flow field. Users are not required to explicitly identify the components or their locations during the grid generation process. The cut cell approach at the boundary is not used in Stallion 3D. Boundary conditions are satisfied using a novel ghost cell method that supports first, second or higher order flow solvers. The scheme is unstructured and can efficiently produce a grid for any arrangement of closed three dimensional components without the need for user intervention. Stallion 3D is equipped with both first and second order (spatial accuracy) finite volume methods to solve the three-dimensional Euler equations. A flux vector splitting scheme is used to determine the correct domain of dependence across grid cells and to sharply capture shock waves. The equations are solved in Cartesian coordinates throughout the entire flow field and does not require the use of coordinate transformations. This reduces the operation count of the finite volume method and increases the overall computational speed of the solver. The flow variables are marched to steady state using a four stage Runge-Kutta method with local time steps. Stallion 3D has built-in tools for post processing and aerodynamics analysis. Contour plots of flow variables such as pressure, density and vorticity can be presented on the design components as well as in the flow field. Streamlines can be initiated at any location in the flow field and stopped or started after a desired time interval or at a specified location. Multiple planes parallel to the x, y and z axes can be viewed to highlight pressure, density, vorticity and velocity contours. Stallion 3D computes lift, drag and moment coefficients for individual objects. Stallion 3D requires a PC running under Microsoft Windows XP or Vista operating systems. It is available as a three months or annual lease. The introductory cost for the thee months lease is $2,995. The cost for the annual lease is $7,495. More information about the software can be found at http://www.hanleyinnovations.com/stallion3d.html. Validation results for the Onera M6 wing can be found at http://www.hanleyinnovations.com/m6wing.html. Hanley Innovations is a leader in aerodynamics preliminary and conceptual design and analysis software for education and industry. Software titles include MultiSurface Aerodynamics, MultiElement Airfoils and VisualFoil Plus. These software packages feature built-in tools for pre- and post processing and intuitive graphical user interfaces.